Summary: In this entrancing novel “that speaks to the Marilyn Monroe and Elizabeth Taylor in us all” (Kirkus Reviews), a legendary film actress reflects on her relentless rise to the top and the risks she took, the loves she lost, and the long-held secrets the public could never imagine. When I was younger, I used to love to read celebrity tell-alls. I honestly don't know why I stopped reading them -- maybe my tastes just changed, but occasionally I crave the gossip and intrigue of Hollywood. And that's why THE SEVEN HUSBANDS OF EVELYN HUGO by Taylor Jenkins Reid probably appealed so much to me. This novel reads just like a celebrity memoir and it's chock full of lust, betrayal, secrets, and more! THE SEVEN HUSBANDS OF EVELYN HUGO tells the dramatic story of the larger-than-life Hollywood star Evelyn Hugo. At almost 80 years old, Evelyn, a very private celebrity and eventual recluse, finally decides to tell her story... but on her own terms, of course. She requests an unknown magazine reporter, Monique Grant; and no one, especially Monique, can figure out why. Monique isn't without her own story. She's kind of in a bad place. Her husband has recently left her after she caught him with another woman, and she has an entry level job writing for a magazine. Writing the authorized biography (and certain bestseller) of one of Hollywood's most glamorous actresses could be just what she needs to get a fresh start. Evelyn is definitely no holds barred when telling Monique her story. There are plenty of juicy tidbits and salacious stories, especially when it comes to Evelyn's seven husbands. She even shares some secrets about her life including a forbidden love! While Monique is fascinated by Evelyn's tales, she still wonders about why Evelyn requested her to write her memoir. The truth is even more startling than Evelyn's life story! 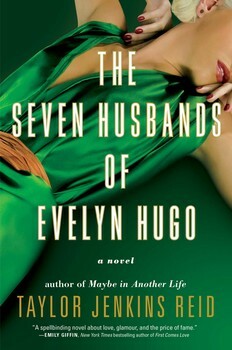 I enjoyed THE SEVEN HUSBANDS OF EVELYN HUGO a great deal. While Evelyn was certainly larger than life, I did feel as if the author created a realistic character. In fact, it was easy to forget that I wasn't reading the memoir of a real Hollywood actress. And of course, I couldn't help but wonder if parts of Evelyn's life story were based on old Hollywood. The novel alternates between Evelyn and Monique's stories, but make no mistake about it --THE SEVEN HUSBANDS OF EVELYN HUGO is Evelyn's story. Don't think for a minute that she'd share the spotlight with anyone! It wasn't until the end that I even understood why the author included Monique in the book. Evelyn begins her story when she was a child growing up in Hell's Kitchen. She continues with her various love affairs and the details about husbands (in chronological order). Of course, you won't be surprised to learn that she didn't always marry for love. She was a young woman trying to make it in Hollywood during the golden age. The specifics behind all of her relationships were sometimes surprising, sometimes sad, but always gossip-worthy. There is a little twist at the end of the novel when Monique realizes why she was asked to write Evelyn's story. I won't say I was totally shocked because I knew she had to be there for a reason, but I admit that I didn't figure out all of the details. I did appreciate Monique's progression as a character throughout the story, but as I said earlier, this was really Evelyn's book! Overall, I did like THE SEVEN HUSBANDS OF EVELYN HUGO and highly recommend it to fans of women's fiction and fans of celebrity tell-alls. My mom still loves books like this! I'll have to get a copy for her. I love celebrity memoirs too - sounds like I'd like this book! You are the second person to recommend this book to me!